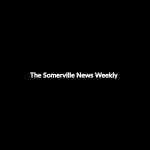 As the city of Somerville rapidly changes, there are more new development projects than ever before. Assembly Row is forever-expanding, the Green Line Extension will be done in the somewhat near future, and Union Square will soon become a major hotspot. But even with the rise of construction, union workers are disappointed in the lack of work. 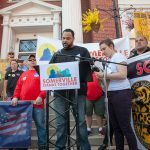 On Thursday, April 26, community organizers and labor unions gathered on the steps of City Hall for the “Somerville Stands Together” rally in support of good jobs, fair contracts and affordable housing.